In a future scarred by fracking and ecological collapse, Jenna Hoolman's world is dominated by illegal smartdog racing: greyhounds genetically modified with human DNA. When her young niece goes missing that world implodes. Christy’s life is dominated by fear of her brother, a man she knows capable of monstrous acts and suspects of hiding even darker ones. Desperate to learn the truth she contacts Alex, who has his own demons to fight. Last but not least there's Maree, a young woman undertaking a journey that will change her world forever. The Race weaves multiple together story threads and realities to take us on a gripping and spellbinding journey. If I were to start this article by stating that The Race is the best debut of the year to date, I'd be telling the truth, to be sure, but I'd be lying to you, too—and that's as apt a tack as any I could take to introduce a review of a book as deceptive and self-reflexive as said. You see, it might be that I was more moved by Nina Allan's first novel than by any other released in recent months—emotionally and, yes, intellectually—but The Race was not released in recent months, not really: NewCon Press published an earlier edition in 2014, which, even absent the substantial and supremely satisfying expansion Allan has added for Titan Books' new and indubitably improved take two, went on to be nominated for the BSFA's Best Novel Award, the John W. Campbell Memorial Prize and the Kitschies' Red Tentacle. And although The Race is indeed Allan's first novel proper, it is, in a sense, a cycle of stories that share subjects and settings, not unlike several of the aforementioned author's earlier efforts, such as Stardust and The Silver Wind. So it's not really a debut and it wasn't really released this year, which leaves just one of my first line's facts unfudged. Happily, The Race actually is amazing, and if you haven't read it already, don't let this second chance pass you by. 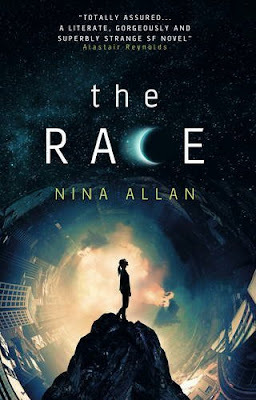 The Race is a book about longing, and belonging. It's a book about identity—how it's formed for us, and how we go on to fit it to ourselves or else ourselves to it. It's a book that teaches us the value of family; the damage those nearest and dearest to us can do, and the good things, too. It's a book that instructs us to take the measure of our previous experiences before moving fully into the future. Valuable enough to kidnap and hold to ransom, to truly devastating effect, not least because the only way Del knows how to raise the money to buy Lumey back from her captors is to wager a sizable sum on his smartdog, Limlasker, winning the Delawarr Triple. "What it came down to was this: Del was proposing to bet his daughter's life on a sodding dog race." (p.67) The race Allan's title refers to, right? Well, you know... yes and no. Christy's share of The Race is only speculative insofar as she writes slightly science-fictional stories set in Sapphire. That said, there is much magic in her narrative, and some tremendously rewarding resonance, culminating in the figurative collision of Christy's world with Jen's when the former rushes to find a missing person that she suspects her brother—a loose cannon reminiscent of Del from the latter's narrative—might have hurt, like he hurt her, or worse. The third and shortest component of the whole addresses race in the ethnic sense. Herein we have Alex, a bit-part player in the second section who, decades later, in the wake of a separation, returns "to the harbour of his home port, a narrow, mean-minded place, rife with old rivalries and uneasy memories" (p.240) at the invitation of an certain writer. Like Cloud Atlas recombined with Jo Walton's wonderful Among Others, The Race is interested, above all other things, "in how the lives of ordinary people can become unfastened from reality." (p.251) As such, it steps back and steps back and steps back, Inception-esque, undoing assumptions and exceeding expectations, until the only way further backward is forward. So forth it goes. For all that, though, it's a wonderfully understated work of words, worthy of all the awards NewCon Press' earlier edition was nominated for. But never mind the date of its publication, nor whether or not it's actually Nina Allan's first novel: in and of itself, The Race is absolutely remarkable.